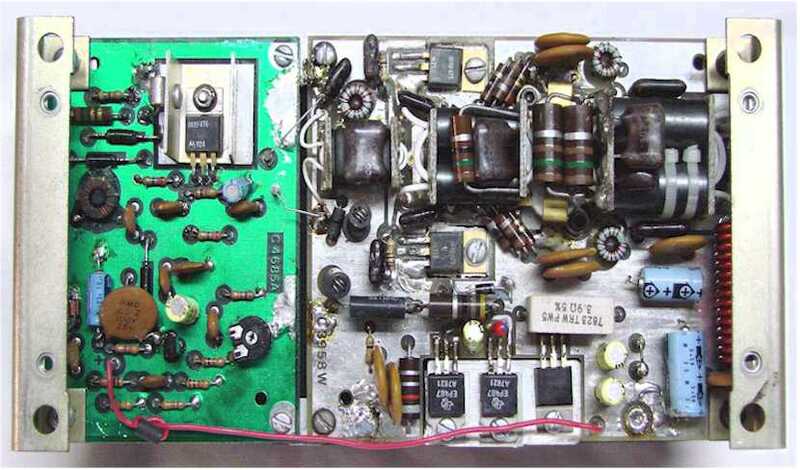 The Power Amplifier Board consists of two separate circuit boards mounted to a large heat sink. The Pre-driver Board on the left side of the picture amplifies the transmit signal to a sufficient level to drive the power amplifier board. The output drive level is controlled from the on-board drive level control. 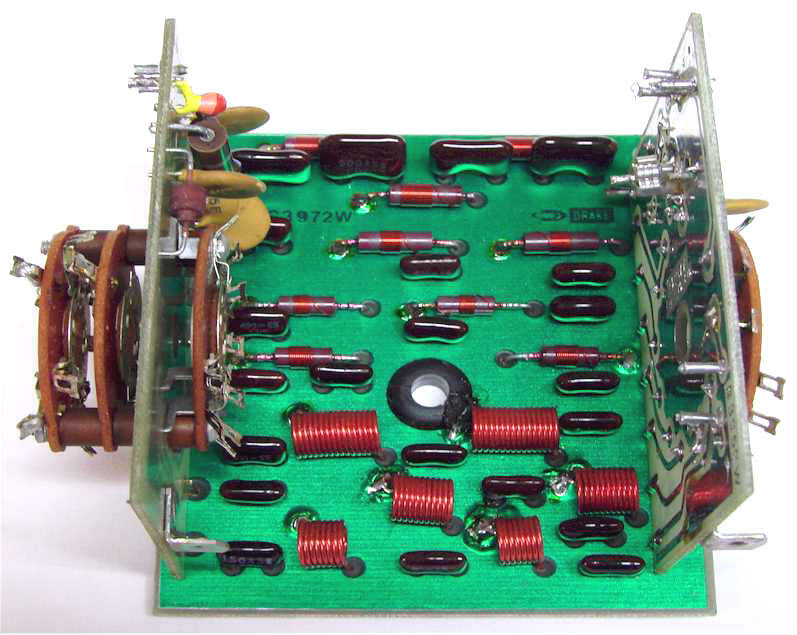 This board operated at 13.8VDC and is switched on during the transmit mode through the relay mounted on the Low-Pass Filter Board. The power amplifier board, right side in picture, has a pair of driver and final amplifier transistors. Each transistor pair operates in push-pull to provide a good balance for proper circuit gain and flatness across all frequencies from 1.8 to 30Mhz. The 13.8VDC supply voltage for the amplifier is connected directly to primary power and is not switched. The bias circuit, transistors across the bottom of the board in the picture, provide sufficient bias to to hold the amplifier transistors in cut-off during receive mode. The Power Amplifier Board takes a very low level signal, typically between 100 and 200 millivolts, from the radio and amplifies that to well over 100 watts of output power. The ALC circuit, located on the High-Pass Filter Board controls the overall gain of the Pre-driver Board to limit the output power to around 100-120 watts output. Even though this amplifier is capable of producing power levels greatly exceeding 100 watts, its not recommended. Running higher power levels over time will significantly shorten the life of the transistors. Typical output power levels of the transceiver are 110-125 watts on all bands below 15 meters, and 80 to 100 watts on all bands 15 meters and above. The High-Pass Filter Board consists of three separated boards. 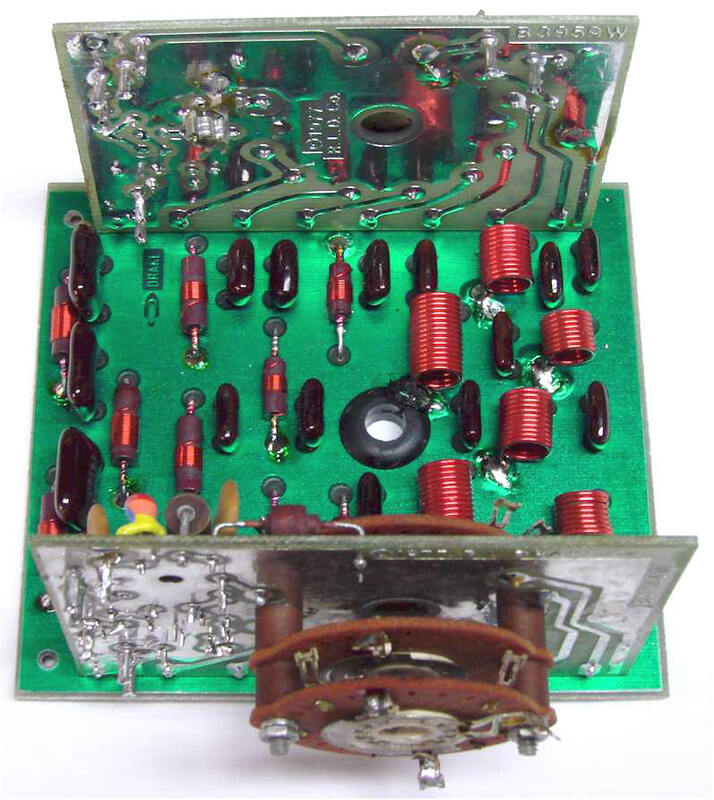 The front and rear boards form seven different pass-band filter circuits which are switched into the signal path with the Band Switch. There is a separate filter for each of the major band segments except for the two lowest bands which are switched straight-through. 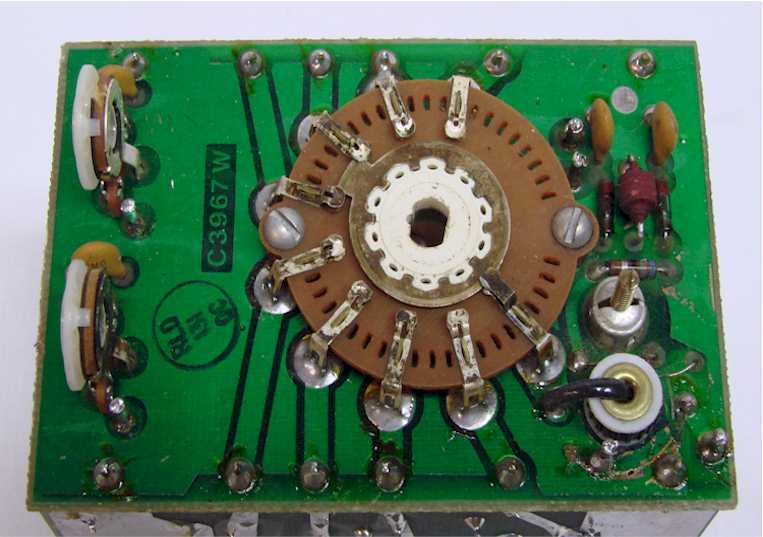 In the receive mode this filter board connects the antenna to the Up-Converter Board and controls the pin-diode signal switching for the 25Khz Calibrator signal insertion. In the transmit mode the signal from the Up-Converter Board is pin-diode signal switched to the Power Amplifier Module. 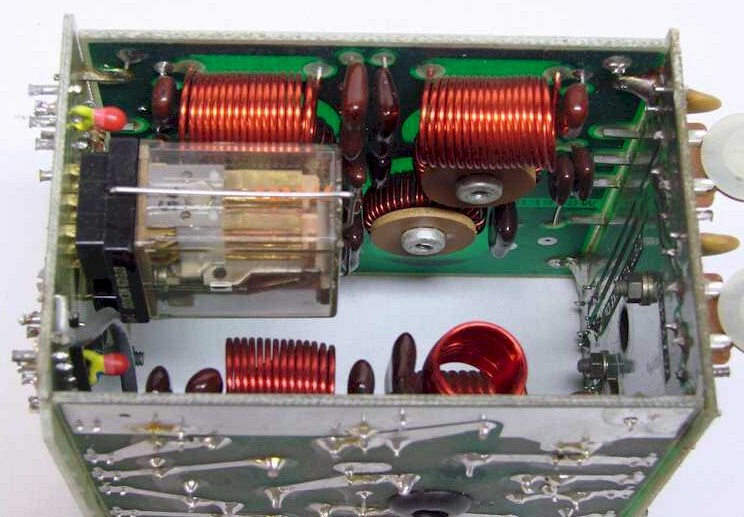 The Low-Pass Filter is a 4 board configuration, T/R Relay on the left. The Low-Pass Filter output side showing the Watt Meter adjustments on the left. The Low-Pass Filter Board consists of four separated boards. The front and rear boards are switching boards ganged to the Band Switch and selects one of eight filters and routes the signal through the transmit/receive (T/R) relay to the watt meter circuit and antenna connector. The T/R relay provides antenna switching, linear amplifier key switching and external receiver muting. The other two boards form the eight individual low-pass filters which are switched into the signal path by the front and rear switch boards. The ALC Board (Automatic Level Control) takes inputs from the forward and reflected wattmeter and the linear amplifier and provides an output that controls the variable attenuator on the 2nd IF/Audio Board. The purpose of this board is to control the drive level of the Power Amplifier to prevent signal flat-topping and provide high VSWR protection caused by an antenna mismatch. 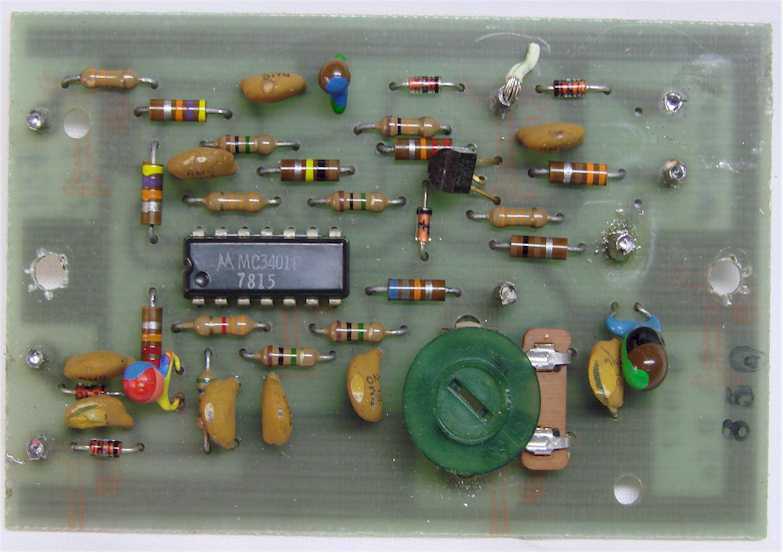 This board also lights the green front panel LED when the ALC circuit is operating.